The Deacons of Southwood led a work day on August 25 to complete several small projects around the grounds of the church property. It was a small affair with maybe 20 folks coming together to spend a morning working together. We pressure washed around the Lodge and courtyard near the Guest Center, removed several bushes from the beds, repainted curbs in handicapped parking spaces, and stained (some of) the fence around the playground. If you look around the building the next time you are here, you will definitely notice the places that look better. You will also notice that the fence staining is not completely finished. It turns out that staining a fence is a bigger job than we anticipated so that didn’t quite get completed. There is a large section of fence that still needs staining. These are all things the church could have paid for and accomplished professionally, but that would have missed the point of the work day. The point of the work day was seen in conversations between new and old friends over a bucket of paint, or siblings taking a break from arguing to rake leaves together, or folks praying together over a job to be done. When we exercise the muscle of service in small ways like this, we are not merely helping to care for the gifts that the Lord has entrusted to us (though that is a good thing to do); we are also teaching ourselves be “on mission” together. 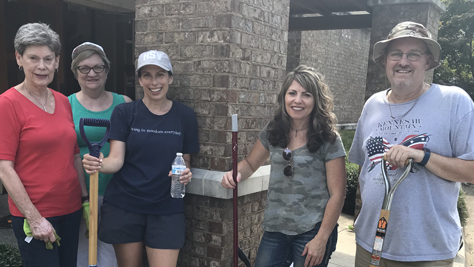 The experience of laboring as a group and the relationships we build at these events help us learn to work shoulder to shoulder together and see the needs of a world around us so that we can be prepared to go together on missions beyond the property at 1000 Carl T. Jones Drive. The Deacons hope to make these small work days a regular part of our life together as a church so that when the Lord puts a big mission in front us – like a hurricane, fire, tornado, or hurting community – we will have exercised that muscle together and be ready to go together. The fence staining project will get done at one of these work days, too, but it was never really about the fence.